What is an Employee Value Proposition (EVP)? What does it take to attract the right people? What does it take to motivate your people? What does it take to retain these people? What is your company’s brand? What is your organization’s Employee Value Proposition? DecisionWise helps you to define your overall employee value proposition and creates specific employee profiles based on similar preferences and demographics. We begin by conducting focus groups to understand what attracts, engages, and retains employees at the organization. The focus groups produce a comprehensive list of formal and informal benefits that are important to employees. We then conduct a survey with the entire employee population to rank-order these benefits and produce employee profiles. 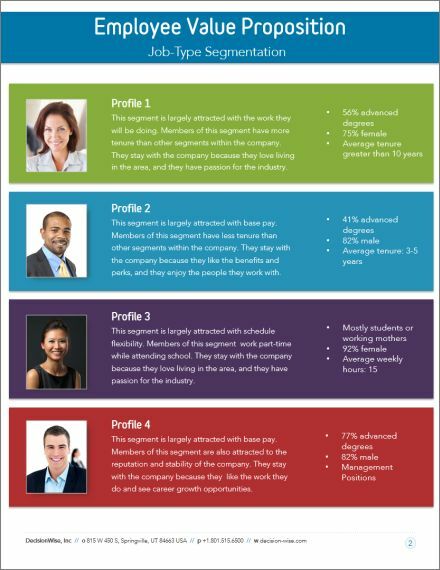 The DecisionWise employee segmentation study creates profiles of employees based on their benefits preferences and demographics. This comprehensive report shows why each group of employee was attracted to the organization, stays with the company, and engages in their work. Now that you understand your company’s employee value proposition for your employees, how do you leverage it to attract, retain, and engage the best talent? A dedicated DecisionWise consultant helps you to implement strategies and actions to use your EVP as a competitive advantage. We help you to improve your hiring process, communicate your total benefits package more effectively, and develop engagement programs that boost performance.